"The Church must be at the center of village life"
A text that is worthwhile! With the advent of neo-gesture of shooting sight (late 19th century), which will be destructive cause of most bows solid wood, come new materials (the Swedish pioneers (SEEFAB, mod.dép) and then french built bow aluminum- zicral (techn.de the SAAB aviation) until 1946 approximately.). But with the revolutionary invention epoxy polymers by Ciba-Geigy in 1946 (glue Araldite), an extraordinary boom and unprecedented transform the know-how of thousands of different sectors. The example of the Firm Authier à Bière (Switzerland), pioneer manufacturer of evolution molded ski hot since 1910, may become the inventor in 1945-1946, the "epoxy sandwich" with its famous ski Vampire laminated wood and metal bonded with glue Araldite. This revolutionary development will be followed by many different sectors, including the archery. 1946 was therefore a revolution within many existing factories but also to new thousands. Wings (S), Border (Scotland), Hoyt (US), etc. The manufacturers of piano and Korean Samick Musical Instruments were the precursors "RecurveBow" inspired directly from their traditional active archery bow with their triple curvature handcrafted even today? In the 50s, it is a genuine industrial explosion in the sports world not only, that will come with these thousands of new businesses for mass production. In 1974, when Blaise Fontannaz, craft resumes production within the abbeys (Morges, Lausanne, Vevey) with its replicas of anciens bows, whole or broken for most, it revived the craft abandoned after the last Swiss Bowmaker "Bourgeois" from its name, cabinetmaker of his state in Lausanne until the 1780s. He has at heart to replicate the finest bows, but especially the older models of solid wood (yew or laburnum). The ancients bows with assembling of several wood (exotic) of Belgian origin, Scottish, British or Swiss, did not attract our purist. The woods were difficult to obtain, but he considered these bows too heavily slow hampered by these mixtures of wood glued however prestigious. (Greenheart, snakewood, hickory, Brazilian boxwood, amaranth, etc.). His erudites Guides the guide and support him in his choice of a purist. After two years, Blaise had already replicated all the most beautiful models currently represented in his collection of Prestige. It is in 1976 that develop in Authier for “sandwisch epoxy” hot bonding techniques and drawing design mold forms of longbow "reflex-déflex". Purist at heart, he would not factory "RecurveBow" which soon supplanted all other types of bows. Because it trought the Recurve against naturally (very wide and very flat, 2 laminated maple and 2 bo-tuff glass fibers from 0,04 to 0,06 inch. !) because it could not exist naturally without the aid of this glue and epoxy glass fiber ! What hardly any sensation procured by practicing instinctive shooting with this type of Recurve. Moreover, this bow is so loud that it could be suitable for use in hunting. Like this new modern archery and with his valuable knowledge sources exceptional wood, he could easily improve the latest models marketed by the manufacturers of bows rights "flatbow" (wide bow and flat, often symmetrical) glued and produced by all known brands. (Ben Pearson, Bear, Black Widow, Martin). Straights Bows glued mass produced and sold commercially, have only 2 or 3 laminatedswood, and at worst with the addition of a layer of industrial veneer of 0.03 to 0,06 inch thickness (gross and of untapered addition), which adds two layers of adhesive glue to a "sandwich glue " content by two important layers of fiberglass (bo-tuff) from 0,04 to 0,06 inch. thick! Always for saving products, veneer inserts are also incorporated into the assembly of wooden handle-riser, making it totally inert while depriving it of its central dynamic ! the minimum wood materials frequently selected in the grain "edge" (which increases the compression phenomenon) or in any direction grain with outgoing rings/circles (increasing the obvious risk of breakage), the minimum craft work and finishing implemented. a one-piece monobloc "wood/glue" minimized by 2 unnecessarily thick glass fibers (bo-tuff), but ensuring the anti-breakage of all, who comes back only in mode "compression" (accentuated by the importance often overdosed the basic form molding of reflex) and makes "boom" in front, string-rope drop ! The only contentation: a look "wood color". Rare will be the last artisans BowMakers that could boast of manufacturing in the rules of art, apart from still rare bowmakers in solid wood, because you can not cheat by using nothing than solid wood, good ! And it is by far not too many that are improvised and decry the "Bowmaker", while buying kits wood and kits fiber glass or carbon in the US for most of the stick on moldings forms they also bought or tinker without notions no natural proportions. But now, anyone would be able, thanks to the epoxy or polyurethane worse (+ soft) that guarantee (for a limited time) of their “offspring so long dreamed” with the worst material ! They even decorate their "flatbow" veneer with yew and pretend they sell bow high performance yew !! Although there are a few more or a less scrupulous, Blaise Fontannaz does not mince words in pointing all these neo-Hobbyist (since 1984 ) "Tartarisan" the profession, denominating them "Glueing kits US". But free to the new host of "neo-Tartarin" which (by ignorant misconceptions) incorporate anything goes, multiple insertions of wood veneer, fiberglass or carbon .... This has the effect of strengthening their famous "mono -block "in its unique mode of compression, rigid and inert, which will make it even slower and will do more" Boum! " But do they know at least the true values of wooden slats kits they buy and boasting about to be the fastest and declaimed on the package insert? Once they have a little yew or Osage Orange, significantly more nothing stop them in their mythical and childish claims. There is "yew and yew " ! Because it barely exists if a mountain of five hundred or more which should make for a single bow! Do we still need to know the nature and the trees ! Even if a very good yew, poorly harvested, badly split, it will produce only very unfavorable quality comparable to the lower category of wood (poplar, pine) ... Paradoxically, the nervous wood of yew bad split with "outgoing circles" become very delicate and break immediately at the slightest fault! Any " somebody" he could brag be able to manufacture an exceptional violin with any of them materials and any what knowledge and claim to perpetuate the know-how of Stradivarius or Garnerius ?! PS: please, do not use designations without knowing or understanding. Make an effort with internet, you can miraculously make it a little less ignorant ..
A true bowmaker, in deserved appellation, is the one who knows the feeling in the success of a controlled mountain yew longbow cutting in the rules of art, which must be designed in section "D" thicker than its width to receive and cause the totally extraordinary phenomenon of the extension (sapwood) and compression (heartwood) natural that the yew has. No other wood can in the world to exceed the speed and aliens performance yew, power/weight ratio confused! The must is to design it with a assembly of reflex riser-handle, with two identical branches-tree grain surfin already has the second natural reflex in its extremity and unconstrained/ heated processus, you will get the rare and fantastic model Diane Prestige Collection, or the model “Bourgeois” laburnum. And it will take 2 full reflex yews to make a single bow laminated-glued ! Detail of assembly to the exit riser-handle. Bow "Jubilee 2000" 2 laminated yew core, 1 laminated exterior / bamboo extension folds within 1 / bamboo compression. Wooden riser of a single block / dynamic (veins flat), well tapered gradually to melt into the laminated (ebony Maccassar). For Blaise, evidence of design the same longbow but in smaller proportions (from 64 to 72 inch.) by splitting the solid wood of a beautiful yew draft thus sacrificed in 4 respectives lam each having the maximum growth rings/circles flat to the riser until the extremity , and rebuild into 2 laminateds for the cor, a thought laminated extension (sapwood or heartwood) and the 4th laminated thought to balance the compression in the initial form of progressive / evolutionary reflexes , all taken in sandwich between two layers of fiber glass made especially for bows by the prestigious Swedish manufacturer of bow Björn Bengtson, of only 0.8 mm. (o, o30 "), thus favoring the thickness of the wood without falling into the appellation of "flatbow" . 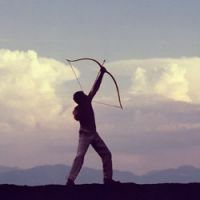 Bows and designed not only retain all the criteria of true Longbow (narrow and thick, expansion / compression in Admin = speed), but gain strength, speed and performance without equal! How perfect with all these criteria, we could not get a new perfection? Rares bowmaker that made this way except maybe bamboo fiber that does not require a good choice of graining flat prevailing breakage bows to the release handle-riser, often over too steep because less labor and know-how. It will take some years to Blaise Fontannaz to complete the double reflex model reconstituted laminated. (1980). He will name the Celtic Bow. - Reflex 2: standard longbow. - Reflex 3 (Toxon), maximum speed, hunting bow. NB: the reflex curves have a calculated complex and evolving geometry. Longbow or Celtic types are possible on measures 60 "to 72 inch., Yew ( taxus baccata) or all wood/tree of the Celtic calendar, and a few special models (Bow exotic wood Féréol, Montouchi, snakewood , etc. , bamboo, etc.). Folding Riser laburnum yew bow "Toxon"
Riser-handle a longbow reflex riser deflex in branches-tree yew laminated with riserwood Snakewood , leather "tobaco". The riser are lined with quality leather. Laces and arrow rests are inlaid made in a very durable leather (dog or kangoo). As for the model Jubilee 2000 "Tradition" quoted in the table on page catalog, all laminated bows can also be made with the two outer plies of bamboo. It is the only assembly reasonably practicable. All other assemblies is considered produce dissociation between different wood species each with its own unique and specific modules of bending elasticity, tensile strength / bending and shear, causing the implosion of collage sooner or later. And moreover by using new ultra-modern materials for rigid strings that accentuate the sound of "bang". "